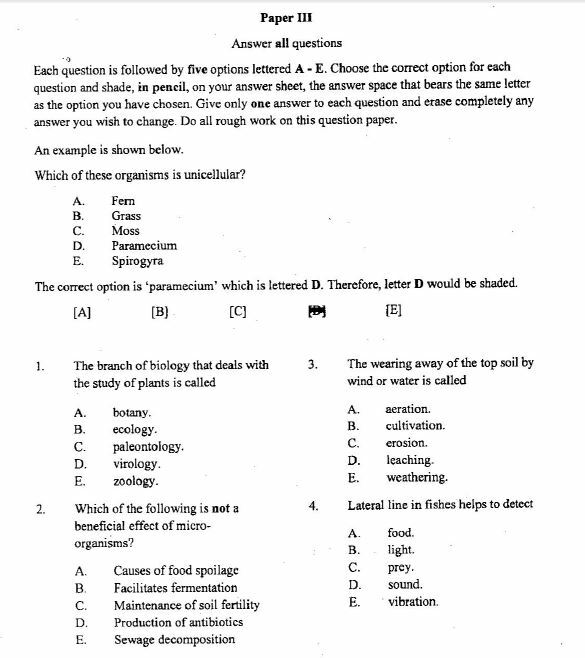 2018 NECO GCE Biology Answers for Objective and Theory Questions Released. The Neco gce biology 2018 answers is now available. The National Examination Council (NECO), General Certificate Examination (GCE) Biology paper will be written today, Tuesday 4th December, 2018. The 2018 Neco Gce biology exam will comprise of Papers III & II: Objective & Essay which will commence from 2.00pm and end by 4.30pm. 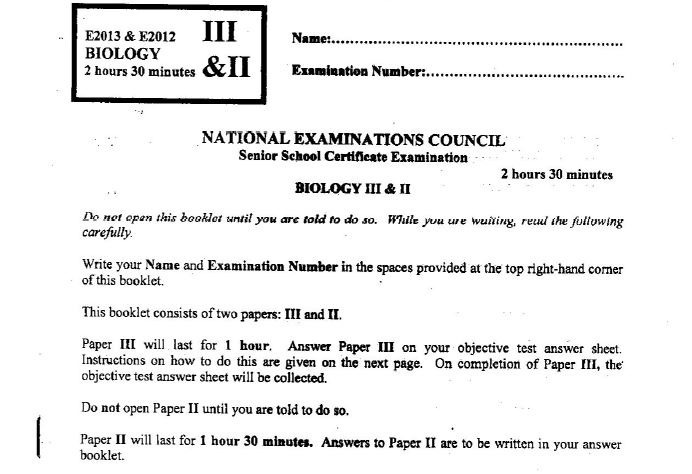 That means the examination will last for two hours thirty minutes (2hrs 30mins) only. 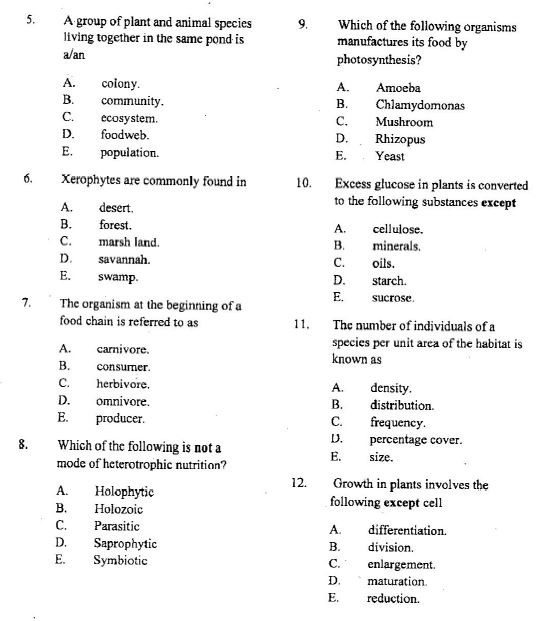 In this post, we will be posting out samples of the neco gce biology questions for candidates that will participate in the examination for practice purposes. Continue reading below. Note that below is the questions from Neco past questions and answers that we feel are likely questions for GCE preparation. Answer any four questions from this section. Each question carries 10 marks. Write your answers in the answer booklet. 1. (a) (i) What is respiration? (ii) Explain three ways in which the respiratory surfaces in mammals are adapted to their functions. (b) (i) Outline how gases are exchanged in the leaves of flowering plants. (ii) In a tabular form, state four differences between aerobic and anaerobic respiration. 2. (a) (i) What is a tissue? (ii) Name two vascular tissues found in flowering plants. (b) Flowering plants are classified as monocotyledons or dicotyledons. (i) What is a cotyledon? (c) (i) What is meant by the term evolution? (ii) Give an account of the evidence for evolution from a named source. 3. (a) (i) What is pollution? (ii) Name three water pollutants. (iii) State five harmful effects of sulphur dioxide in the atmosphere. 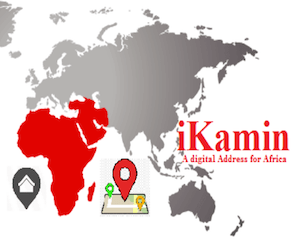 (b) (i) Explain the term population. (ii) Explain how a pitfall trap is used to measure the population size of organisms in a habitat. 4. (a) What is an enzyme? (b) What name is given to the substance that an enzyme acts on? (c) Name two minerals required by the human body? (d) In the case of one of these minerals, state its function in the body. 5. (a) (i) Bacteria reproduce asexually by dividing in two. What term is used for this form of asexual reproduction? (ii) What do bacteria form when environmental conditions become unfavourable? (iii) What does the term pathogenic mean in relation to bacteria? (b) (i) Name an organ in the human body, other than the kidney, in which excretion takes place. (ii) In which part of the flower is pollen produced? (iii) In which part of a flower does a seed form? (c) Name another member of the kingdom to which Rhizopus belongs, other than yeast, and explain how it is of benefit to humans. (b) A normal male marries a female carrier of haemophilia. With the aid of a genetic diagram, determine what proportion of their offspring will suffer from the disease. (c) State the two laws of inheritance propounded by Gregor Mendel. Note: There is nothing like Neco Biology Expo online. Neco Gce candidates are to desist from patronizing online fraudsters / vendors who says they can provide such services as they are not real.